In Engineering theory and applications, we think and operate in terms of logics and models with some acceptable and reasonable assumptions. The present text is aimed at providing modelling and analysis techniques for the evaluation of reliability measures (2-terminal, all-terminal, k-terminal reliability) for systems whose structure can be described in the form of a probabilistic graph. Among the several approaches of network reliability evaluation, the multiple-variable-inversion sum-of-disjoint product approach finds a well-deserved niche as it provides the reliability or unreliability expression in a most efficient and compact manner. However, it does require an efficiently enumerated minimal inputs (minimal path, spanning tree, minimal k-trees, minimal cut, minimal global-cut, minimal k-cut) depending on the desired reliability. The present book covers these two aspects in detail through the descriptions of several algorithms devised by the ‘reliability fraternity’ and explained through solved examples to obtain and evaluate 2-terminal, k-terminal and all-terminal network reliability/unreliability measures and could be its USP. The accompanying web-based supplementary information containing modifiable Matlab® source code for the algorithms is another feature of this book. A very concerted effort has been made to keep the book ideally suitable for first course or even for a novice stepping into the area of network reliability. The mathematical treatment is kept as minimal as possible with an assumption on the readers’ side that they have basic knowledge in graph theory, probabilities laws, Boolean laws and set theory. 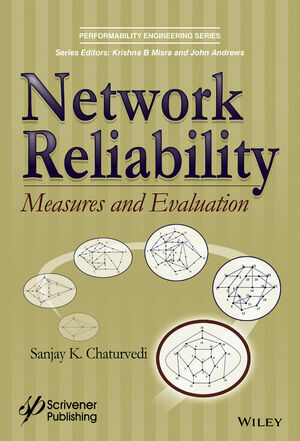 Sanjay K. Chaturvedi is currently working as an Associate Professor at Reliability Engineering Centre, Indian Institute of Technology, Kharagpur (WB) India. He received his Ph D. degree from Reliability Engineering Centre, IIT Kharagpur (India) in year 2003. He holds a Bachelor's degree in electrical engineering and Master's degree in system engineering and operations research, both from Indian Institute of Technology, Roorkee. He has research interests in the areas of reliability modeling and analysis, network reliability, life-data analysis, maintenance and optimization, and has done several consultancy projects, and delivered lectures in Indian industries in these areas. He has guided several Ph.Ds. and published papers in several international journals.